Those who know me understand my viewpoint on smoking. I support personal freedoms and everyone has the right to do awful things to themselves (just don't do it near me) but I just can't understand why they would. This morning, on my way to the office, I walked by two people dressed for running who had taken a break to smoke. I passed them quickly and only caught a second of their conversation (which was in German) but I wondered how they could rationalize combining a healthy run through mid-town Manhattan with the indulgence of a cigarette break. I didn't look to see if they continued their run after the smoke or if they turned into the adjacent Dunkin Donuts to continue their hedonism. It did make me wonder how many runners are also smokers. It seems like a weird combination of behaviors but I'm guessing the percentage is higher than most would think. 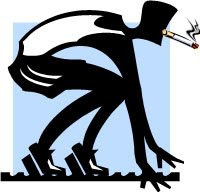 Never having been a smoker it's easy for me to judge and I am admittedly naive about how difficult it is to quit. All the same I just don't get it. I have to admit, I'm with you....I just can't figure it out! Unfortunately, I think it's even worse among soccer players. I play in an Irish league in the Bronx and it's not infrequent for the players on an opposing team to smoke a cigarette during halftime! Certainly makes you feel awful if you lose the game. When it comes down to it, there are more than a few unhealthy behaviors frequently found around runners. When I was younger it seemed like all the runners around me ran because it was a dimension of their anorexia. Earlier today you mentioned the addictive aspect of running too. I guess if it came down to it I'd take a cigarette smoker who runs over a cigarette smoker who doesn't, but still, you're right, something's wrong there. If you're not running or playing soccer for your health then what's the point? I definitely plan to do a run in Cambridge - from Kendall Square over the Longfellow bridge to Charles Street and back. However, the weather report has 6 inches of snow moving through the NE on Sunday. In that case it'll be the Precor treadmill at the Marriott. I hope the snow misses N.C.!